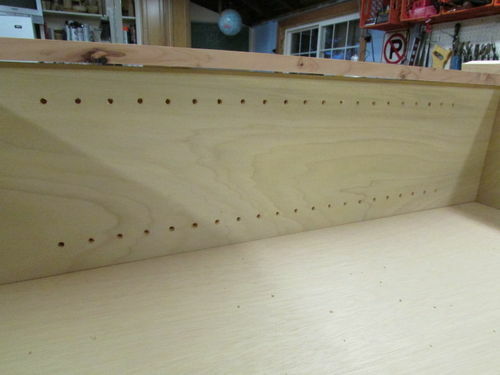 Have you ever noticed holes , neatly in a row, on the inside of many book cases and cabinets? Have you ever wondered how they might have gotten them so straight, and evenly spaced? Maybe you have, maybe you haven’t. I never really gave it much thought until I decided that I may want to attempt to build something that needed some adjustable shelving. This jig is one way that a do-it-yourselfer may be able to add those adjustable shelves to your project! 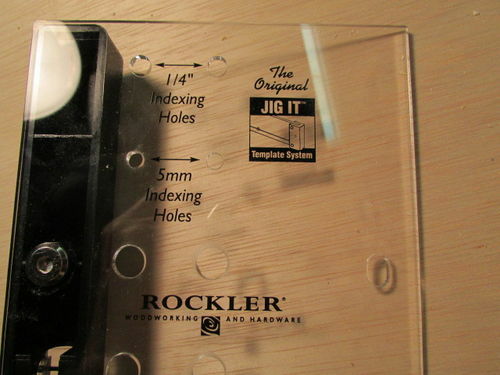 It is a shelf pin drilling template sold by Rockler. Opening the package (clear plastic) exposes it’s contents. What you see here is what you get. You get the clear acrylic template, the black fence (un-installed), the Intsy bit, three binding posts and a hex head wrench for installing the fence to the template with the binding posts. Assembly is easy and adjustable depending on the application needed and the spacing of the holes from the edge of the material. 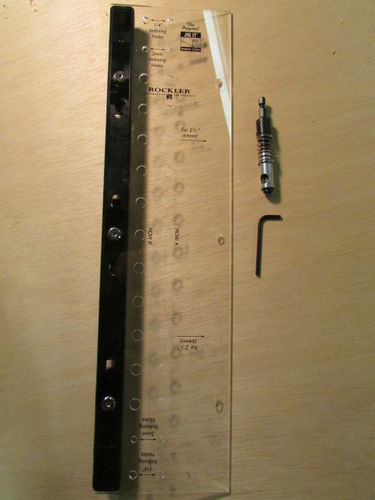 There are two sizes available for drilling the holes, 5mm and 1/4”. 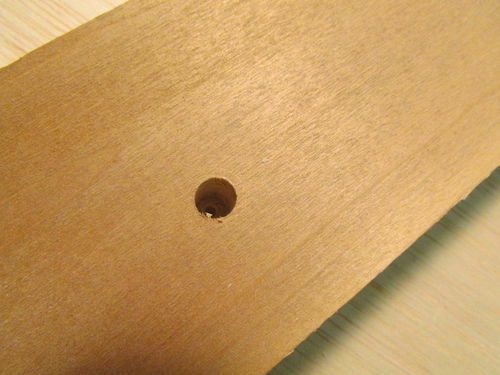 I chose the 1/4” hole size because it is larger than the 5mm and should provide more “heft” for holding the shelves. Bigger is better… right? The template has spacing and holes for both sizes included on it. The only factor in determining the size of the hole drilled is the drilling bit that is purchased with the template (kit) or separately. 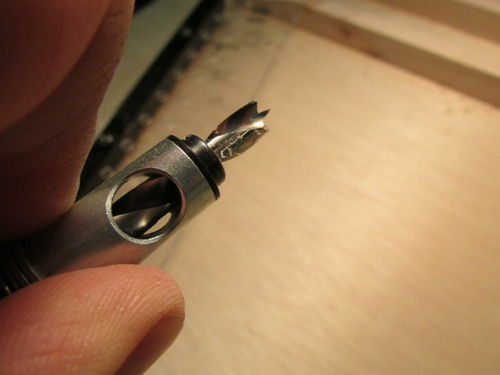 The template is the the same for either size, only the drilling bit used is different so, one template and two bits of differing sizes (5mm and 1/4”) give you all the options that are available for this particular jig. Use is pretty straight forward. I won’t go into detail about how to use it but a quick review of the instructions on the package will give you what you need to know about the options available on the jig. I determined where I wanted the shelves to be and the range of adjustability I needed. I measured for center of that range and marked all sides so the holes would be on the same plane. Place one of the holes centered over the mark and align the fence or edge of the template with the edge of the work piece and start drilling! 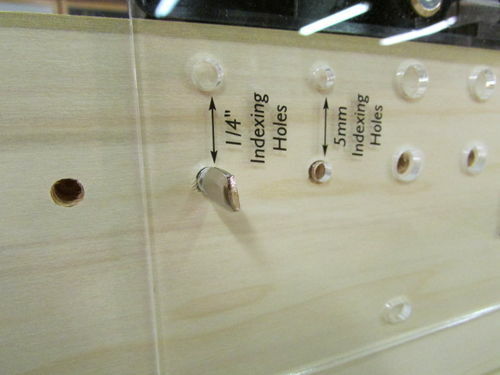 When the line of holes needs to be extended, just move the template and align the appropriate aligning hole over one of the previously drilled holes, insert a shelf pin into the template hole and the hole drilled in the piece. Continue to drill the holes and moving the template along until the desired amount of holes are drilled. Move around the edges of the pieces until all of the rows of holes are drilled. The template works by providing equally spaced holes along its length for the bit to be installed and drilled. 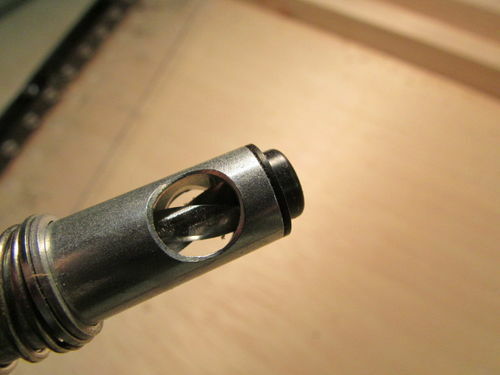 The bit is a brad point bit surrounded with a housing that aligns with the template hole and allows the spinning bit to be plunged into the wood with a preset depth and a return spring to draw the bit back into the housing. It’s simply a self centering drill bit, if you are familiar with one of those. The results of the set up are pretty simple, a straight line of equally spaced holes of a consistent diameter. Like this. 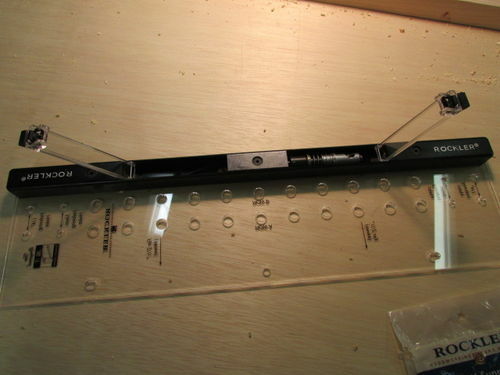 The jig can be used with the face frames installed or without face frames installed. There are also two storage compartments on the fence of the template for storing the drilling bit or bits (if you own both sizes) and the hex head wrench (for fence adjustment). 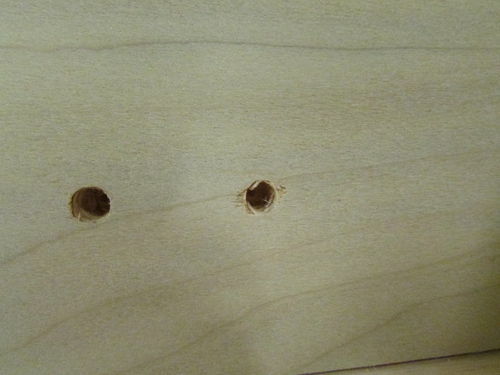 I experienced some tear out around the edges of the holes when drilled into poplar plywood. Not really a big deal to me. I did try drilling a hole in solid poplar and the hole was clean so, I think the issue is really with the material being drilling in, not the bit itself. Anyone could make such a template for themselves and buy the self-centering bit and save a few bucks. For the sale price of this item ($27.99) it was worth it to me to purchase it as a kit. The bit alone costs about $17, so I got the template included for only $10 more. Overall, I am pleased with this purchase and I will find a lot of use for it in the near future when I start to build some storage for the house that will have adjustable shelving in it. Thank you Brett for a good review. I will be building kitchen cabinets and your review of this jig is helpful to me. thanks for the review.i’ve looked at it before and will feel better about purchasing it when i need to make some more adjustable shelf’s. Your welcome guys! I would get it while it’s on sale. It comes up every so often. Full price seems like a bit too much to spend for what it is but it does what it’s is supposed to do and it’s easy to use. 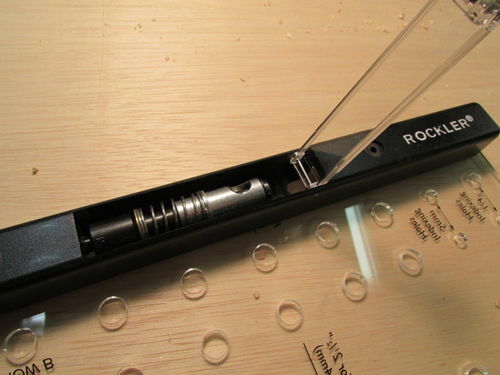 I have one and I think they are great for drilling shelf pin holes. I bought one of these several years ago when I was building some bookcases for my daughter’s room. I like how they now put some storage in the sides for the bits (my version doesn’t have that so the bit gets moved around in the cubby space). Like you, I found this jig very useful and well thought out. I own the same jig…worth the money for me, as well. Nice write up. Thnx for your review Brett. Just a reminder that pegboard, which costs basically nothing, and a scrap of wood can make a super cheap substitute for this jig. Not as convenient, but a heck of a lot cheaper. I have one…. easy peasy right out of the box. Thumbs up !